Just so you know, my circle of friends which extends from central California, down to here in the San Diego area, we love TSRF cars and all their upgrades. We have tried other brands over the years, but we have exclusively gone to racing TSRF when we get together. Your product is fantastic, reliable and really, near-perfect. Thanks again for getting back to me so quickly. Got the car and prepped the body. Car is awesome. Beat lap record by 0.2 secs. Under these conditions first nite. Standard 4 lane Ninco with 25 ohm Parma controllers. I’m pleased to let you know that the package arrived this evening (Thursday, June 5). Again, I am very pleased, thank you! The TSR design has not changed much in the past 10 years and is still unchallenged in its ability to out-handle any unmodified, out-of-the-box production slot car. TSR cars can be seriously raced and pushed through corners with none of the vicious handling qualities of most of their competition. Unlike its competitors that use cheap and fragime Polystyrene, the TSR simple universal chassis is built of the best quality, glass-filled Nylon on the planet, that also provides the smoothest and longest-lasting bearing surface for the rear axle. Every component is of high quality material and functions as it should.The TSR cars are manufactured in America using American materials, save for its motor, made to our specification in one of the finest electric-motor companies in China. TSR produces its own clear-plastic bodies or uses the finest Slot.it bodies in collaboration with the Italian company. 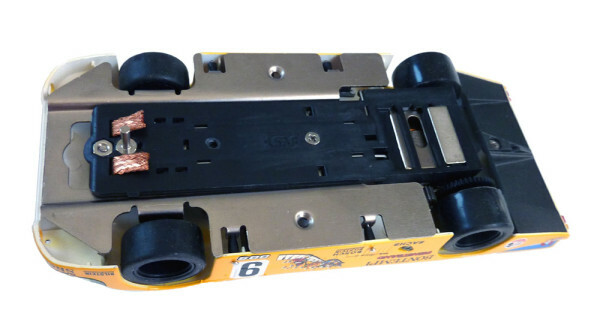 Many slot car bodies can be fitted to the TSR universal chassis. I like the pin instead of a guide flag. I had to install a pin on one of my cars out of necessity (small nosed F1) and honestly couldn't tell the diff. From the comments above, it does not appear to bother too many of the TSR cars owners either. Philippe , the chassis bears a striking resemblance to the Cox Truescale 1/43 cars I've seen on epay lately. Really like the idea of the pin guide design, must be so nice not to have to deal with a flag! Paul, it does resemble the Cox chassis because it was my design. The TSR chassis is an evolution of it and 40 years later it still works pretty well according to the fellows racing them.